This edited work draws together research on performance assessment as an alternative to the multiple choice tests used widely in the USA. 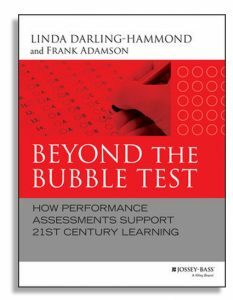 Performance assessment is defined as “authentic assessments that require students to develop a product, response, analysis, or problem solution that reflects the kind of reasoning or performance required beyond the classroom setting”. It is argued that schools need to focus on higher order skills such as critical thinking, analytical reasoning and communication skills: skills critical to student success in a contemporary world. Given that assessment methods often negatively distort what goes on in the class, it is further argued that performance assessment tasks best support the development of these higher order skills. Many New Zealand teachers will identify with the examples of performance tasks provided. The book outlines how, in the US, performance assessment, which had become more common in the 1990s, faced problems of costs and conflicts with educational policy such as “No Child Left Behind”. It was simpler and cheaper to demonstrate accountability by testing students using multiplechoice tests that encourage recognition of simple right answers rather than the production of ideas. One significant point for New Zealand teachers is the discussion of the benefits of teachers being centrally involved in performance assessment. By developing and using performance assessments – as well as reflecting on student work – teachers better understand standards, curriculum, and their students.